Trump's opponent, meanwhile, may garner a more than substantial electoral vote margin, but she entered the campaign as largely self-damaged goods, and as over-the-top as Trump's attacks and characterizations of her may have seemed, she will emerge, almost unthinkably, with her credibility even more tattered. If she does put up the anticipated big numbers nationally, she will do so while providing the almost scandalously scanty coattails of someone who claimed the election by a proverbial gnat's whisker. Yes, the O.B. knows as many four Democrats are poised to pick up senate seats, but if they do, their thank-you notes should go not to the person at the head of their ticket for lifting them up, but to the GOP standard bearer for pulling his own people down. Constant rumors of unethical and immoral conduct and innuendo are a family tradition for the Clintons, as are their predictable counter-claims that they are being persecuted by shadowy right-wing ideologues and other bitterly partisan conspirators. We may be assured that even if the email flap that has dogged Hillary's campaign this year ultimately dies down, her time in office, however long it may be, will be constantly punctuated by rat-a-tats of disclosures and allegations of ethical misconduct, tantamount to the serial "bimbo eruptions" that dogged her hyper-sexed hubby. We all know the polls are "rigged," of course, but they are still the best thing we have to go on, and they currently show Trump with little prospect of chipping a single brick off the Blue Wall. 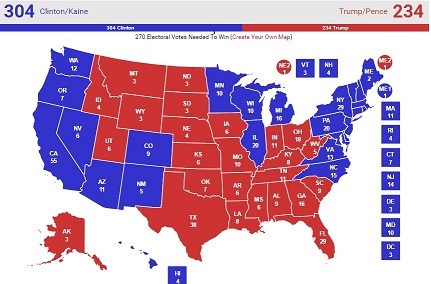 If we look at how Trump is faring poll-wise compared to the actual showing of Mitt Romney in 2012, he is trailing in North Carolina, but seems to have at least a decent shot at besting Romney by claiming the "toss-up" states of Iowa, Ohio, and Florida. Accounting for 53 electoral votes among them, these states are no small prizes,but, according to the accompanying projection, courtesy of realclearpolitics.com, even if he pulls this off, he would still stand at only 234 electoral votes compared to Hillary's projected 304, leaving him well shy of the magical 270 total needed to make 1600 Pennsylvania Avenue go all Trumpazilla. Beyond that, Trump is facing enough of a challenge in traditionally red-to-the-roots states like Georgia, Arizona, and, for God's sake, UTAH (!) that his campaign has had to devote precious time and resources simply to hold onto his once-presumed base--time that could have been spent in states he needs desperately to drag into the GOP column. Curiously, although Trump seems to be shut out of the White House by an impenetrable barrier of Democratic voting consistency, he actually owes the continuing viability of his candidacy to a corresponding pattern of Republican partisan rigidity. In fact, Sam Wang points out that despite all the apparent ups and downs of his campaign, D.T. 's support has remained "level as a pond" at roughly 41 percent. 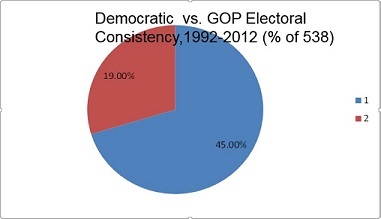 Citing the rapid rise in partisan polarization over the last generation, Mr. Wang notes that from 1952 to 1992, the average swing or range, plus to minus, in a presidential candidate's support over the course of a campaign was 17 percent, while, over the last six elections it has shrunk to only 8 percent. More remarkably still, despite what seemed one politically disastrous incident after another, including his thrashing at the hands of the family of Capt. Humayan Khan, Donald Trump's support has varied by only 4 points, between 39 and 43 percent. The pundits have asserted more than once that Trump's backers represent a sorely disaffected minority upset over immigration, outsourcing, political correctness, and other conditions contributing to a sense of lost opportunity and relevance. This may well be true of his most strident followers, but if you are looking for somebody likely to vote for ol' Donnie, your best bet is still your nearest Republican (Ditto and vice-versa for a Hillary voter, as well ) The Republican ranks may also hold a number of "silent voters" too embarrassed to tell a pollster that they actually plan to cast their lot with The Donald on November 8, but while their boy may fare well enough in the popular tally to sorely discomfit the Left, Middle, and even some on the Right, it appears at this juncture at least that these resolutely mute voters will suddenly have to let loose with one hell of a bellow to affect the actual outcome. The O. B. has recently become less interested in the campaign itself than in its aftermath. He has already noted that Hillary is likely to emerge looking and feeling as though she has done fifteen rounds with Boom Boom Mancini. (Eat your heart out, Warren Zevon.) Beyond that, when Trump's irresponsible, vengeful nonsense about a rigged election and his invocation of the "Second Amendment crowd" elicit comments to the effect that if Ms. Clinton is allowed to take office, and "has to go by any means necessary, it will be done," we are reminded that the demise of Trump the Candidate will not mark the end of Trump the Menace or, more troubling still, the powerfully frightening mindset he has so recklessly exploited. This page contains a single entry by Jim Cobb published on October 31, 2016 11:51 AM. Emmett Till's "Then" Isn't Our "Now"* was the previous entry in this blog. HICKS IN THE STICKS SHOULDN'T BE THE PUNDIT'S QUICK FIX is the next entry in this blog.